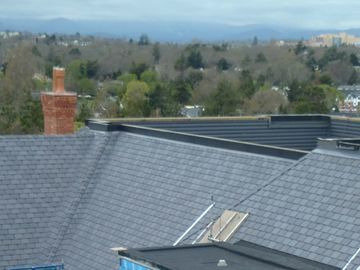 Top Line Roofing Ltd provides professional commercial and residential roofing in Victoria and the surrounding Vancouver Island area. We offer low slope (commercial) and steep slope (residential) roofing for a wide range of clients. Whether you need a complete new roof installation or just a small patch repair to prevent water leaks, we have the well-trained staff and WorkSafeBC COR certification to ensure your project is completed on-time, on-budget and accident-free. For more information on the different types of commercial and residential roofing we offer, please see the additional information on this page. 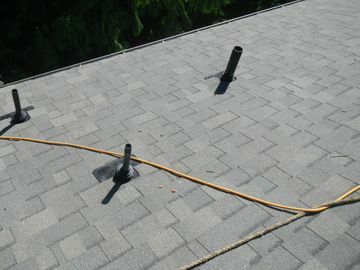 Ready to start your roof project? Call us today to book a free in-person consultation with one of our roofing specialists. TPO roofing systems are similar to EPDM. Where EPDM is a rubber product, TPO is made from vinyl. These systems are laid out and typically heat fused to form a large continuous membrane. Seams can also be fused with solvents, producing a seam that’s as strong as the rest of the membrane. SBS roofing material is an asphalt product modified with a rubber similar to car tires. This is a very popular roofing system for its versatility. Hot applications melt the asphalt together to create a strong seal; it can also be hot-mopped like built-up roofing systems. Newer cold applications are available that utilize cold applied adhesives and self-adhesive membranes. 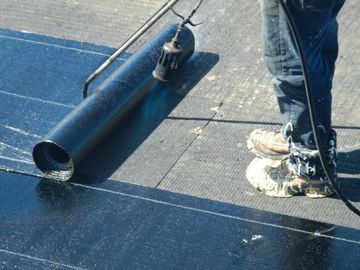 Typical application is a 2 ply roofing membrane including a torched on base and cap sheet. Top Line Roofing Ltd. installs more SBS than all other roofing types, which has made an expert in application. While it is quickly becoming a more popular roof choice, green roofs have been around for centuries in Scandinavian countries in the form of sod roofs. 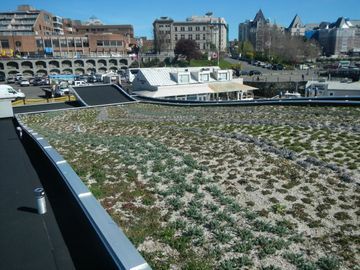 Modern versions of this roof comprise a growing medium over layers for root protection, drainage and roof deck waterproofing. In current usage there are two types of green roofing; intensive and extensive. Intensive roofs have a deeper growing medium, and support the growth of a wider variety and larger size of plant. Extensive green roofs are designed to be self-sustaining, have a thinner growing medium and less maintenance requirements. EPDM is a rubber that has many uses, commonly used for car door seals, pond liners and among other things, single ply roofing systems. Seams in this roofing system can either be heat welded, or bonded with a solvent, turning strips into one continuous rubber layer ensuring a leak free roof. EPDM is available in various thicknesses and is a great choice when a faster roofing application is needed, or when doing a very large area. This system is very light and is usually adhered, ballasted or mechanically attached to the roof deck. EPDM is a specialized installation that Top Line’s roofers have been trained in. Built up roofing (BUR), commonly called ‘tar and gravel’ is the original low slope flat roof system. 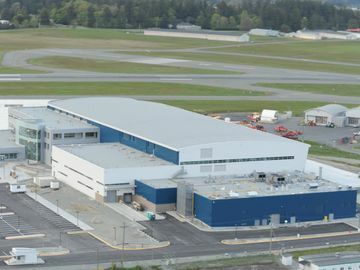 It is built up in at least 4 layers of oxidized asphalt and felt then covered with a layer of gravel to protect the membrane from fire, UV damage and the wind. Modern versions of this classic roof use superior products such as rubberized asphalt adhesive and fiberglass or composite felt plys. The newer products allow this roofing system to greatly outperform its earlier counterparts. Fiberglass Shingles, also known as Fiberglass laminate shingles, are one of the most popular shingle choices. They are a modern update of the older asphalt shingle using fiberglass matting in place of an organic mat to increase lifespan of the shingle. Made from a fiberglass mat, asphalt and ceramic granules, they are durable, long lasting, fire proof, hail proof, rot proof, algae resistant, wind resistant and they come in a wide variety of colours to suite your style and home. Fiberglass shingles are a great choice for any sloped roof. While fiberglass shingles are frequently referred to as if they were a different type of shingle, they are still technically asphalt shingles. Top Line Roofing installs both Natural Slate roofing materials and Synthetic Slate. 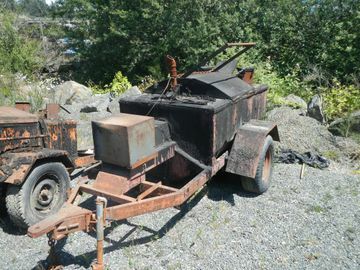 Both materials offer incredibly long service life. Natural slate tiles are waterproof and offer incredibly long expected life spans. Slight variations in colour and shape of this natural product give the attractive look of a natural product. Synthetic slate tiles give the look and much of the benefits of the natural product without the weight of real stone while being more consistent in colour and shape. Top Line is one of the few companies in BC that uses an RCABC approved roll-forming machine. 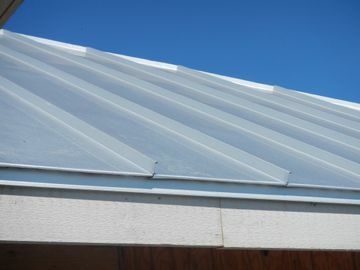 Our standing seam metal roof panels are formed onsite with a standing seam and are one continuous piece from ridge to eaves, no seams, no leaks. Metal roofing comes in a wide variety of colours and different metals. Our sheet metal workers are the best in the business and can handle any metal roofing project. Metal roofs have many advantages as they are lightweight, low maintenance and have a life expectancy of over 50 years. Asphalt shingles are commonly used in residential roofing and are the product most people are familiar with. Asphalt shingles have been around since 1901 and are the most widely used roofing material in North America. These shingles were originally created by saturating an organic mat in asphalt to make it waterproof, then applying an adhesive asphalt coating and covering it with ceramic granules to help protect it from damaging UV rays. Advances in the products used to make shingles have greatly increased their lifespan. These shingles come in a wide variety of colours. The most popular variant is fiberglass shingles.